The British-born American journalist Edwin Lawrence Godkin edited the Nation, a politically influential weekly magazine. 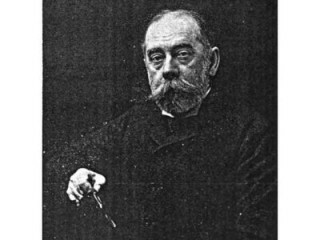 Edwin Lawrence Godkin was born in Ireland, the son of English parents. He studied in an English public school and at Queen's College in Belfast before moving to London to study law. He soon began work in publishing and later became a correspondent for the London Daily News. From 1853 to 1855 he covered the Crimean War and then toured the United States, traveling through the South and West writing articles on slavery. He moved to New York City, completed his law studies, and was admitted to the New York bar in 1858. Godkin continued writing for the London Daily News and also penned editorials for the New York Times. He soon conceived of founding a political and intellectual journal patterned after England's famous Spectator. By 1865 he had raised the money and the first issue of the Nation appeared. The circulation of the Nation was never large, rarely rising above 10,000, but it rapidly became influential. It was read by a select company of American opinion makers: editors, politicians, professors, and writers. Godkin used it to advocate low tariffs, civil service reform, and reduced government expenditures and to attack political corruption. His ideas had force and influence, but his doctrinaire mind tended to isolate him from the mass of Americans, especially politicians. The philosopher William James, who acknowledged an intellectual debt to Godkin, wrote that Godkin "couldn't imagine a different kind of creature from himself in politics," and an opponent once said that Godkin approved of nothing since the birth of Christ. In the early 1880s Godkin's sphere of influence expanded when the Nation merged with a daily newspaper, the New York Evening Post, and he became editor of both. The Evening Post and the Nation led the bolt of the so-called Mugwumps, who refused to support the Republican party's somewhat-tarnished 1884 candidate for president, James G. Blaine. Godkin continued his battles until failing health forced his retirement in 1899. He died in May 1902. View the full website biography of Edwin Lawrence Godkin.